Seasonal Affective Disorder is real, y'all, and despite having lived on the east coast for almost 5 years now (omgosh, what?) I still haven't adjusted to the long winters. This particular winter was mild; we hardly had any debilitating snow storms. But despite, winters here last from early December until mid March. That's a long time for this native Californian! I may not have grown up on the warm and sunny beaches of Southern California but the winters in Northern CA, while cold, still had bright sunlight which makes them all the more bearable. 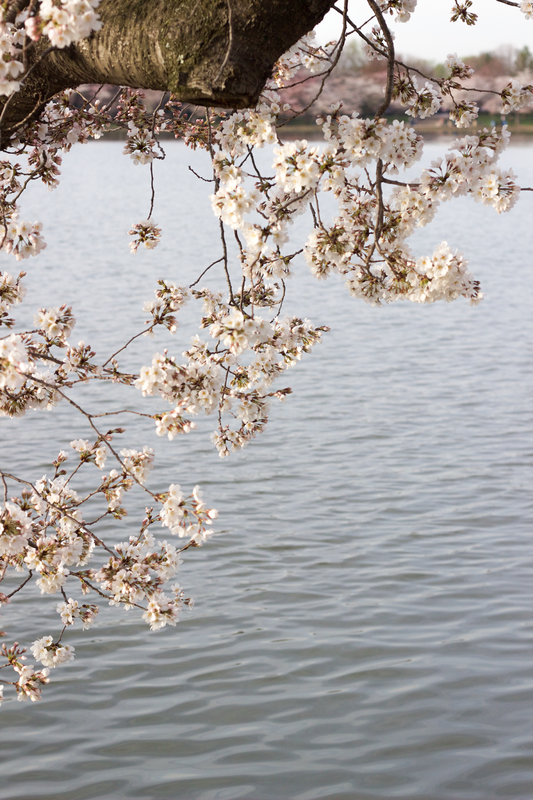 Winters here are very challenging for me which is why the cherry blossoms at the Tidal Basin are really meaningful to me personally. 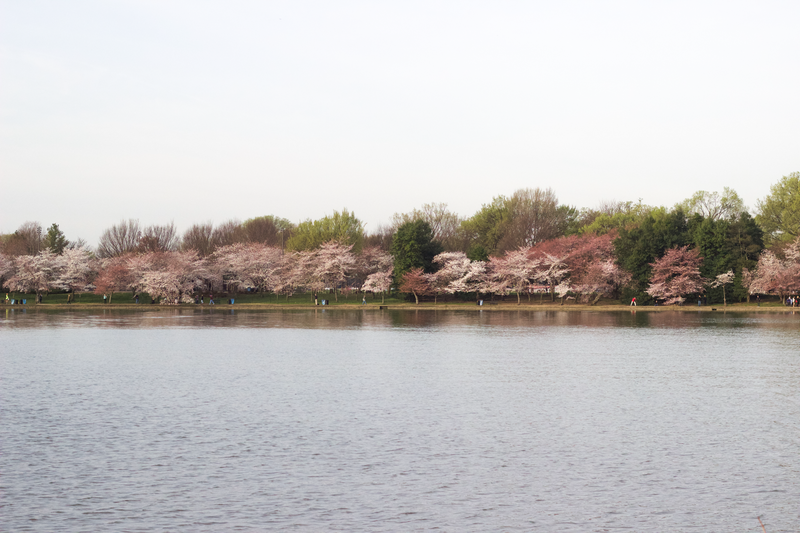 A quick 30 second history lesson for you first: the cherry blossoms at the Tidal Basin were gifted to the people of the United States from the people of Japan in 1912. 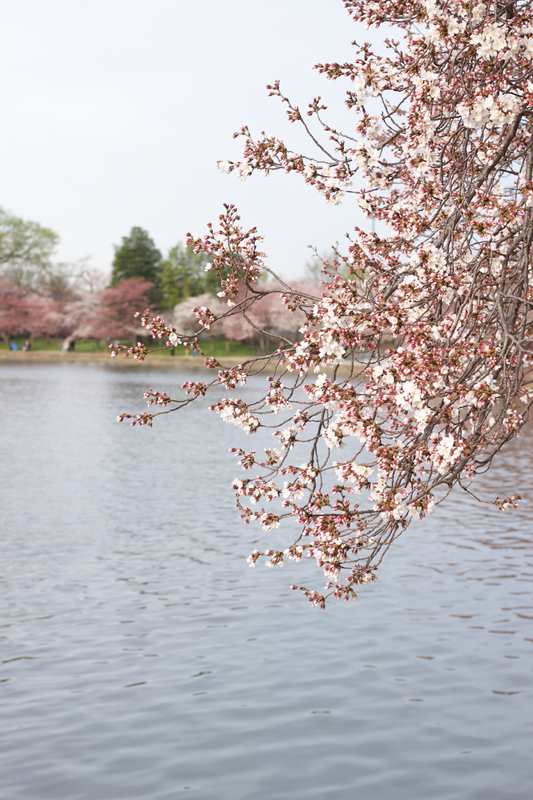 Over 3000 trees from a lineage of trees on the Arakawa River in Tokyo were given to the United States to be seeded along the Potomac River. The first two trees were planted by First Lady Helen Taft and Viscountess Chinda, the wife of the Japanese Ambassaor, as a symbol of a diplomatic friendship. The United States reciprocated the gift by gifting flowering dogwood tress to the Japanese in 1915. The trees bloom for small window of time that varies annually based on the weather. DC celebrates every year with a two week festival with a fireworks, parades, kites, galas and more. Dozens hundreds Thousands of people flock to DC to get a glimpse of the trees and the city is packed. 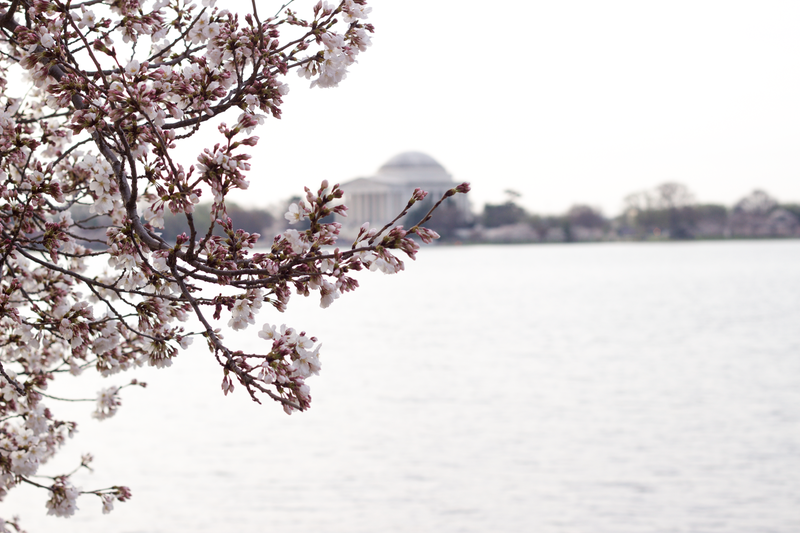 The cherry blossom full bloom signifies the the start of spring in DC. The energy of the city really changes and people are out and enjoying all the beauty the city has to offer. Myself very much included. 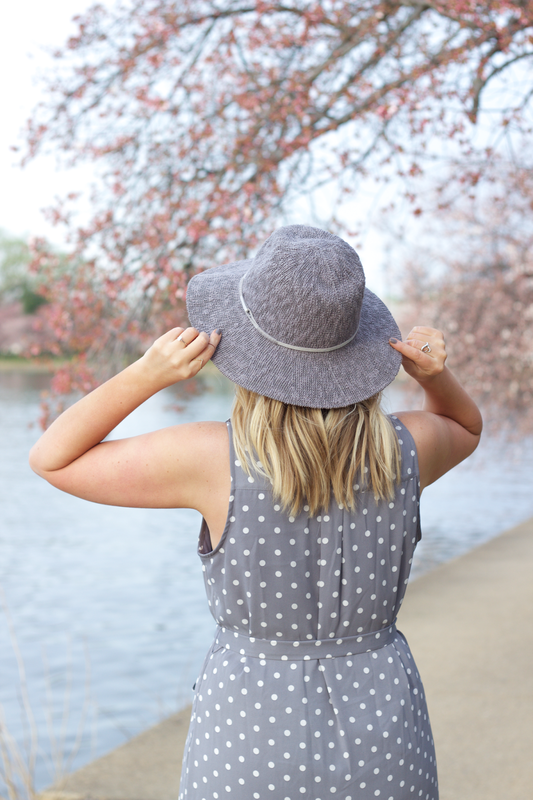 Kristyn and I decided to head down to the Tidal Basin early one morning to enjoy the trees without the crowds and it was far more magical than I expected. Our idea was to head down, enjoy a quiet morning, catch some good light for pictures and head to work. All of which we did. But the tranquility of the morning, the quiet of the water, and the enjoyable company was far more impactful than anticipated. I know I struggle with seasonal depression but it's one of those sentiments that is only clear after the fact. I've admittedly struggled with depression in my 20's -- something I'm not ashamed or embarrassed to share. As such, I've learned tools and mechanisms to nip it in the bud when I can feel the familiar feeling creeping back. But for some inexplicable reason, I don't find myself as self aware during the winter which is as blue as it is frustrating. So the cherry blossoms are a spring awakening and this particular morning offered me the opportunity to catch my breath, exhale, and find enjoyment in the simple things. A good friend of mine lived abroad in Japan for two years and taught me the meaning of hanami. Hanami literally means flower viewing but is a practice as well. 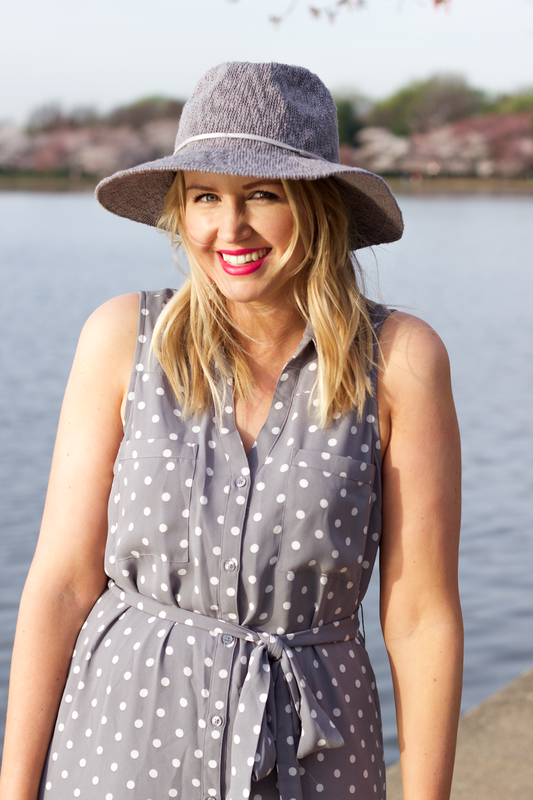 Hanami is a the practice of taking time to enjoy a picnic or celebration under the beauty of the blooms. I repeat, it is a custom to take a break, celebrate with friends and enjoy the the springtime. What a genius idea, right? I could use some more hanami in my life. Couldn't we all? This practice serves as a good reminder to take that time for ourselves and revel in the natural beauty the world gives us -- no matter how dark we may have seen the winter to be. So, peace out winter. You will not be missed. I didn't know that about those trees-so cool. Your outfit is adorable! Such a GREAT POST!! Love the story and how the photos turned out!! !